i don't know about that exact doll, I would guess it may be a one of a kind creation. 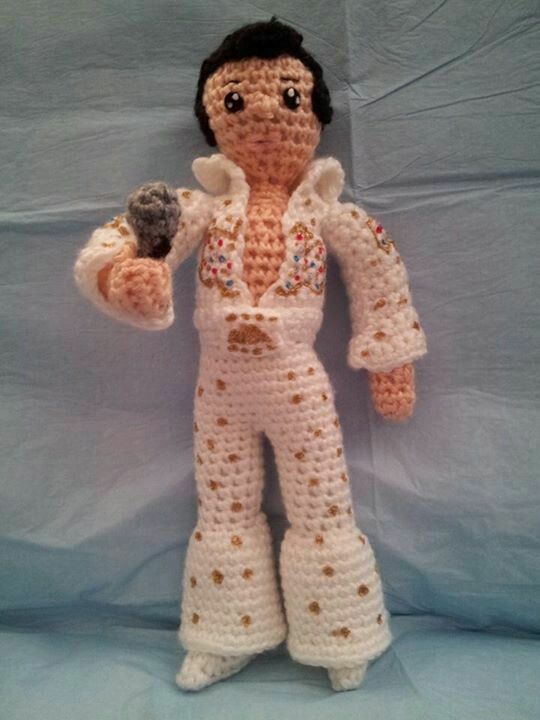 the book Amigurime https://www.amazon.com/AmiguruME-Make-Cute-Crochet-People/dp/1454703970/ref=sr_1_1?ie=UTF8&qid=1503787506&sr=8-1&keywords=amigurume+make+cute+crochet+people has directions to make bodies, limbs, heads, in different proportions so you can make relatively realistically shaped dolls. in the look inside there you can see different famous people made with these parts. on the back cover, bottom right corner, i believe is their Elvis. In googling I one in Spanish (different than this one), which I won't link to because there's no indication that they had a licence to make a pattern available (against forum rules, sorry). He is cool, though.